This historical fiction is the love story of Richard of Gloucester and Anne Neville. If you are a Richard III hater or someone who likes historical fiction to be almost completely factual, this may not be the book for you. But I am neither of those types of people, so I loved this book. THE PLOT: The book starts with Richard being fostered as a child by Warwick at Middleham and meeting Warwick’s daughter, the young Anne Neville. It ends with the birth of their son, Edward of Middleham. In between is a turbulent ride of betrothals, betrayals, rebellions, marriages, other marriages, and kidnapping. Young Anne is betrothed to Richard in her father’s bid to keep power away from the grasping Woodvilles, family of Queen Elizabeth. But when Warwick rebels against Edward IV, the betrothal is broken and the Neville family is exiled. When Warwick allies with Margaret of Anjou, queen of the former King Henry VI, Anne is betrothed to Margaret’s son Prince Edward instead. When Warwick leads an army against King Edward, Margaret allows the marriage to be performed, but not consummated. Her and her son’s treatment of Anne is marked by mental and emotional cruelty. 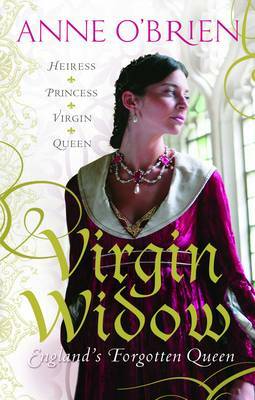 Once Warwick is defeated and Prince Edward is killed, Anne returns to Edward IV’s court as a wealthy heiress. There she becomes a pawn in a struggle between Richard and his other brother, George, Duke of Clarence (who is married to Anne’s sister Isabel), for Anne’s inheritance. MY TWO CENTS: I just can’t stress how much I loved this book. Anne was written as a believable and sympathetic girl, struggling to stay strong amid the crazy turmoil she’s unwittingly trapped in. Despite what you know of Richard III, you can freely let yourself believe that he and Anne are childhood sweethearts torn apart. Even during the fight with Clarence over her inheritance, the reader can believe that Richard truly loves her and is trying to protect her. I was perfectly willing to let go of my knowledge of Richard as Richard III and just flow with their story. Are there any hints that Richard COULD be a monster? That he would disinherit is own nephews and possibly kill them to take his brother’s throne? There are moments when Richard is described as a warrior, a ruthless constable of England. But the reader is led to believe that this ruthlessness is used only to serve his brother, King Edward, and protect Anne, his great love. Even his slaying of Prince Edward of Lancaster is described as either a brutal murder OR defense of King Edward. If you know nothing about Richard, you might not pick up on the subtle hints that Richard CAN be manipulative and cold-blooded. There is nothing in the book that nods toward the future that awaits following the death of his brother. My own knowledge of these future events still didn’t detract from my pleasure in the book. BOTTOM LINE: Lovers of romantic historical fiction should enjoy this book. Of course, readers should keep in mind that this is historical fiction, and those with real interest in facts about Richard and Anne should turn to nonfiction. Just remember that history doesn’t record what went on between them during their private moments. TEACUP RATING: Five out of Five teacups. Anne O’Brien is now on my must-read list. I wish all her titles were available in the US, but I’ll just get them from Amazon UK. 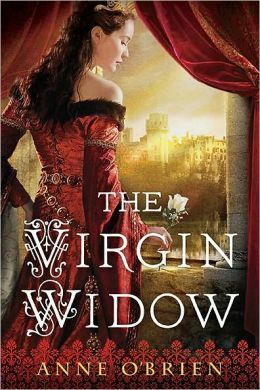 ON SALE DATE: The Virgin Widow is available in eformats and trade paperback now. I enjoyed this book on Richard and Anne far more than Philippa Gregory’s on the same subject. And I do believe Richard and Anne had a pretty decent marriage until the tragic time near the end of both their lives. I did slightly object to having Richard as the killer of Edward of Lancaster, as this was a late addition to the ‘mythos’ that has grown up around Richard III and seems to have no basis in fact. The first accounts of the battle merely have Lancaster killed in the rout; this was backed up by a letter written by George of Clarence. Later, it was said Lancaster was captured and taken before Edward IV, who struck him and then he was killed by Edward’s men (no names). Later still, Clarence is implicated, and Richard latterly, only when it was politically expedient to do so. Archer, thanks for your comment! I also doubt that Richard killed Edward of Lancaster in reality. I interpreted that scene as more symbolic, to represent different ways to interpret all of Richard’s actions. Anne is at first bothered by “the murder,” which she views in a dream, and later happy to be persuaded that it was defense. Obviously it took place as a real action within the confines of the novel; but I saw it as representative of the other actions not covered in the novel that might be viewed in multiple ways. I also found myself enjoying this interpretation of their story more than I did “The Kingmaker’s Daughter,” although I find that book interesting for other reasons. Philippa Gregory often seems to throw these “What if?” scenarios in her books, and the idea that Richard’s usurping of his nephews was all Anne’s idea (and his mother’s) is intriguing to explore. I do prefer this version of Anne, though!